• Citizen-officers: The Union and Confederate Volunteer Junior Officer Corps in the American Civil War by Andrew S. Bledsoe (LSU Pr, 2015). Bledsoe draws from a large sample (almost 2,600 men) for his study of the company grade volunteer officers of Civil War regiments. I like that he did both sides together as I am sure there are some rich areas of contrast. The book explores the ideology, development, and culture of these "citizen-officers," while also charting their capabilities and experiences from initiate to veteran. "Through an analysis of wartime writings, post-war reminiscences, company and regimental papers, census records, and demographic data, Citizen­-Officers illuminates the centrality of the volunteer officer to the Civil War and to evolving narratives of American identity and military service." Sounds fascinating. Ragan: "CONFEDERATE SABOTEURS: Building the Hunley and Other Secret Weapons of the Civil War"
Close study of the Civil War will uncover many examples of Confederate attempts to use technological innovation to counteract gross disparities in manpower and resources. Many of these advances were developed and implemented by a small group of men led by Texan Edgar Collins Singer. The subject of Mark Ragan's Confederate Saboteurs: Building the Hunley and Other Secret Weapons of the Civil War, the Singer Secret Service Corps was founded in early 1863 at Port Lavaca, Texas and was composed of a diversely skilled team of inventors and investors (perhaps 25-30 in number) drawn from Edgar Singer's Masonic lodge. Singer, on detached duty from a Texas artillery battery, developed a spring loaded detonator for mines ("torpedoes") intended for both land and nautical uses. His demonstration to Confederate authorities successful, Singer and his group were contracted to produce torpedoes full-time, their Secret Service activities operating under the official military umbrella of the Engineer Department to prevent execution if any of the corps members were captured while deploying the devices. From isolated Port Lavaca, Singer Corps agents were distributed all the across the Confederacy, to New Orleans, Richmond, Charleston, Mobile, Selma, and other threatened places in need of their services. Ragan notes many isolated successes in sinking Union vessels, including ironclads, but it should also be appreciated that the mere presence, and even rumor, of Singer torpedoes tended to keep enemy ships at a respectful distance from southern rivers, bays, and harbors that would otherwise have been indefensible. The biggest problem with the underwater mines lay with their relatively brief lifespan (one that was improved later in the war). It is likely that Admiral Farragut knew this and was confident that most of the mines were rendered harmless by extended immersion in the salt waters of Mobile Bay prior to his famous naval attack. While the ironclad Tecumseh was sunk immediately the rest of the Union fleet reported brushing against numerous mechanically inert contact mines. This would make Farragut's immortal order "Damn the torpedoes, full speed ahead!" more calculated risk than popularly believed. Over a few weeks time in late 1863, Singer agents in Tennessee derailed eight Union supply trains with ingeniously designed land torpedoes. In most cases, repair crews were able to fix the damage in less than a day. In response, Union track patrols were quickly stepped up and the danger was largely eliminated. However, while railroad torpedoes at the limited scale used were regarded as little more than a nuisance by Union authorities, one wonders what the effect on the federal logistical system might have been had the Confederates devoted more resources to the project and operated over a much wider area. In addition to mining, other agents were involved in boat and bridge burning operations, the former of which became a serious disruption to transport assets along the Mississippi. The Singer group not only designed and constructed static and floating mines of different varieties but also submarines and torpedo boats. Some of the technology was truly futuristic. Ragan uncovered evidence that self-propelled torpedoes (powered by some time of rocket) able to be launched underwater from tubes were under development. They even tried using an electric motor purchased in the North to propel a torpedo boat but found that these expensive engines generated insufficient power. Of course, the most famous Singer Group project involved the submarine CSS Hunley and Ragan documents its design, construction, trials and ultimate demise. With the Hunley sinking the Housatonic and other successes by Singer torpedoes, the Confederate Secret Service attempted to ramp up operations in 1864 but suffered a crushing blow when one of its operatives carelessly allowed documents naming fifty agents and their locations to be captured. Copied and distributed to Union forces, knowledge of Confederate personnel and plans led to key arrests and severely disrupted Secret Service operations. With many records burned (for obvious reasons) in the waning moments of the war, surviving Confederate Secret Service documentation is especially fragmentary, making it difficult for researchers to reconstruct timelines, connect the dots regarding operations, and discover information about personnel and projects. In the book, Ragan does an exceedingly fine job of taking what's known, including many recently uncovered sources by Ragan himself and others, and painting a more than reasonably coherent picture of the activities of the Singer group. During the final weeks of the war, the group was putting the finishing touches on a massive steam powered ironclad torpedo boat at Buffalo Bayou near Houston. Unfortunately, the fate of the vessel (and that of a smaller new submarine that may or may not have actually existed) is tantalizingly unknown. Nine Union naval vessels (including five ironclads) were confirmed sunk by Singer torpedoes and there's little doubt that a number of unconfirmed kills exists among the dozens of other ships cited in federal records as being destroyed or damaged by underwater mines. The Singer group's critical role in defending ports and waterways gave the corps an impact and significance far beyond their meager numbers. Ragan is likely not exaggerating when he rates the achievements of the Singer Secret Service Corps equal to that of any ten Confederate infantry regiments. 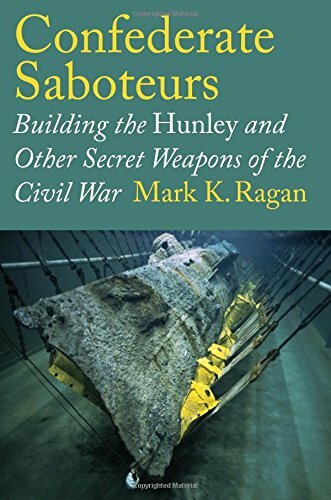 A skillfully crafted in-depth study of a very difficult subject to research, Confederate Saboteurs is an important new addition to the naval and covert operations histories of the Civil War. • The Civil War and Reconstruction in Indian Territory edited by Bradley R. Clampitt (Univ of Neb Press, 2015). From the publisher: "The Civil War and Reconstruction in Indian Territory is a nuanced and authoritative examination of the layers of conflicts both on and off the Civil War battlefield. It examines the military front and the home front; the experiences of the Five Nations and those of the agency tribes in the western portion of the territory; the severe conflicts between Native Americans and the federal government and between Indian nations and their former slaves during and beyond the Reconstruction years; and the concept of memory as viewed through the lenses of Native American oral traditions and the modern evolution of public history." In addition to Clampitt's introduction, there are eight essays by Richard McCaslin, Clarissa Confer, Brad Agnew, F. Todd Smith, Christopher Bean, Linda Reese, Amanda Cobb-Greetham, and Whit Edwards. If you follow the title link you can see the full table of contents via 'Look inside'. • A Just and Generous Nation: Abraham Lincoln and the Fight for American Opportunity by Harold Holzer and Norton Garfinkle (Basic Books, 2015). In the first half of the book, Holzer and economist Garfinkle seek to establish and support their argument that "Lincoln’s guiding principle was the defense of equal economic opportunity." The second half looks at the current state of economic inequality in the U.S. and discusses (I guess) where going back to Lincoln might lead us in terms of bolstering the middle class. Publisher Savas Beatie recently tweeted the cover of a tantalizing title scheduled for 2016 — Too Useful to Sacrifice: Reconsidering George B. McClellan's Generalship in the Maryland Campaign from South Mountain to Antietam by Steven R. Stotelmyer. I don't think I've ever come across any of the author's previous writings that might shed light on what direction he's likely to take. A quick Google search tells me he's an Antietam battlefield guide and the author of The Bivouacs of the Dead: The Story of Those Who Died at Antietam and South Mountain. I know someone who would kill to be the first person to read this book. • Border Wars: The Civil War in Tennessee and Kentucky edited by Kent T. Dollar, Larry H. Whiteaker & W. Calvin Dickinson (Kent St Univ Pr, 2015). Border Wars is the military companion to Sister States, Enemy States: The Civil War in Kentucky and Tennessee (Kentucky, 2009), an essay collection that deliberately avoided the battles and leaders approach to focus on economic, political and social themes. Border Wars restores the balance. "Part 1: Battles, Skirmishes, and Soldiers" is composed of six essays. They contrast Kentucky and Tennessee militias, discuss the Battle of Franklin, explore occupation and irregular warfare along the Green River and also in the Jackson Purchase, recount the abandoned 1861 campaign to rescue the Unionists of East Tennessee, and examine the sometimes contentious relationship between homegrown Tennessee Union regiments and other U.S. occupying forces. "Part 2: Leaders" also has six contributors plus an Afterword by B.F. Cooling, who has written extensively about all aspects of the war in the region. Included in this section are essays reassessing Felix Zollicoffer, Don Carlos Buell, and Braxton Bragg's conduct of the Stones River Campaign. Confederate high command disharmony is the subject of another chapter as is one comparing the successful command traits of Grant and Forrest. The final piece looks at the relationship between Tennessee Governor Isham Harris and the Confederate Army of Tennessee. 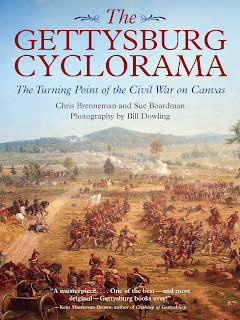 Brenneman, Boardman and Dowling: "THE GETTYSBURG CYCLORAMA: The Turning Point of the Civil War on Canvas"
The Gettysburg Cyclorama is arguably the most famous Civil War painting. If not viewed firsthand among the millions of visitors to the battlefield itself, it was probably introduced to many through the pages of the superbly illustrated Time-Life series of Civil War books. 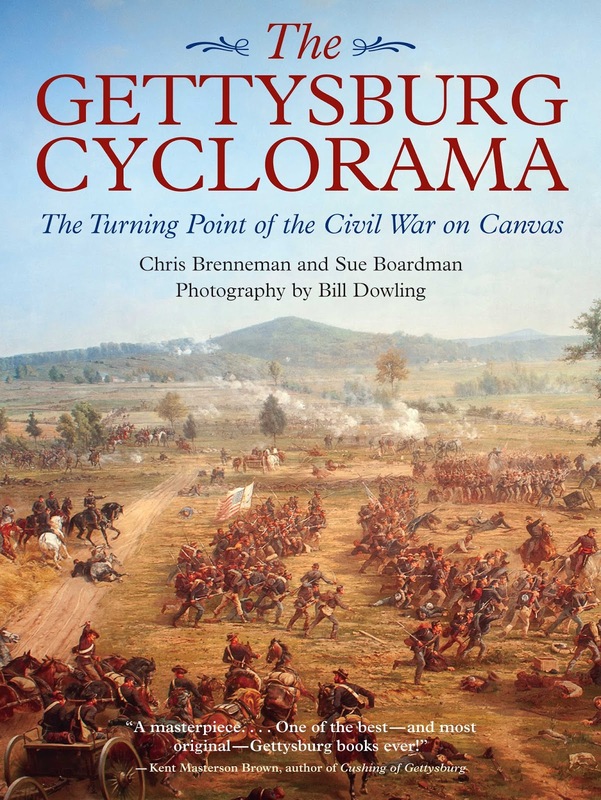 With text from Chris Brenneman and Sue Boardman and photographic images from Bill Dowling, the painting's details and history are presented in unprecedented depth, context and clarity in The Gettysburg Cyclorama: The Turning Point of the Civil War on Canvas. The book begins with a brief overview of the cyclorama phenomenon, which was an evolutionary step from the moving panorama [long scrolled paintings that were unrolled in front of the stationary viewer] for making grand moments from history alive to the observer. Cycloramas were a European creation that peaked in popularity in the late 1800s, with American audiences flocking to depictions of the great battles of the Civil War. The process of creating these art works is described in brief. Documentary research and interviews with participants were enhanced by meticulous landscape photography (in the case of the Gettysburg Cyclorama, the 1882 images of William Tipton). From this a 1:10 scale study was created which was then enlarged through grid projection (using images photographed on glass plates) on an approximately 50 x 400 foot canvas. A team of artists, each a specialist of landscapes, objects, faces, figures, etc., would then paint the final product. The massive painting, which could weigh 6 tons, was then hung in a specially designed building, the massive weight causing an inevitable sag in the middle giving the painting an elliptical shape much like a squat hourglass. To enhance the realism, tons of earth, battle debris, and vegetation were carted into the building and carefully arranged along the flooring below the painting. Many visitors, who were situated in a raised circular deck in the middle, remarked how they could not tell where the diorama ended and the painting began. There were four Gettysburg cycloramas created by the team led by French artist Paul Philippoteaux. All depicted Pickett's Charge in a similar manner but with differences based on criticisms, updated information, or local flavor. The painting was not intended as a snapshot in time but rather an aggregations of key events that occurred during the famous assault. Each version is named after the city where first exhibited (Chicago, Boston, Philadelphia, and New York). The book details their history as well as their unique features. Only one, the Boston cyclorama, survived the ravages of time to be displayed in restored fashion in Gettysburg today. The "tidbits" chapter of the book explores a number of interesting sidebars, among them the artist self-portraits incorporated into the painting, the controversial "European" straw stacks, and the interpretation of the Tipton photographs in the context of the changes that occurred on the ground during the nearly two decades following the battle. Another chapter documents changes (ex. extra flags, diminished smoke, addition of Meade and staff) made to the cyclorama after its Boston unveiling in 1884, most likely in response to feedback from veterans and others. Deserving of special mention is the quality and quantity of illustration in the book. Every page is packed with period photographs, drawings, and illustrations as well as crisp and vibrantly colorful modern images of the cyclorama. Close-ups allow readers to see details uncovered by the 2008 restoration. Skillful juxtaposition of archival and modern images pinpoint changes in both the painting and the battlefield over time. The rest of the book, perhaps two-thirds of its length, is devoted to the most comprehensive "key" yet created for the fully restored Gettysburg Cyclorama. The original 1880s key was copied onto a single sheet fold-out with the entire painting traced in a donut shape. 57 objects of interest were labelled and very briefly captioned in the center. These guides to the painting were sold for a nominal fee to visitors. The key created in the book is far more extensive. The entire painting is divided into ten panels called "views" (designated 0 through 9 in keeping with Tipton's original number system). A chapter in the book corresponds to each view, all beautifully rendered in large scale on facing pages using Dowling's photography. Tipton's original landscape research photograph is also paired with Dowling's closely aligned modern image for comparison. The key for each of the ten views labels by letter those individuals, military units, objects, and ground features deemed to be of special interest, up to twenty in number. Far from merely identifying singular features of note in the painting, the book offers several paragraphs of annotated historical context, description, and interpretation for each item. The Brenneman, Boardman and Dowling key runs nearly 150 pages and comprises an exhaustive and uniquely invaluable guide to the cyclorama for visitors and armchair readers alike. Equally useful as both guidebook and serious history, this is clearly the most important work yet published on the Gettysburg Cyclorama. If any experience might serve as a worthy substitute to visiting the painting in person reading The Gettysburg Cyclorama would be it. • "My Greatest Quarrel with Fortune": Major General Lew Wallace in the West, 1861-1862 by Charles G. Beemer (Kent St Univ Pr, 2015). Gail Stephens's recent examination of the entire military career of Lew Wallace in her fine book Shadow of Shiloh was a thorough, balanced and fair treatment that overall offered a favorable view of Wallace's generalship. Charles Beemer's new book, the latest title from Kent State's thus far excellent Civil War Soldiers and Strategies series, instead concentrates on the early war period through Shiloh. According to the publisher's book description, Beemer's "extensive investigation of primary sources reveals that a number of existing interpretations concerning Wallace, Grant, Halleck, Grant's aide John A. Rawlins, and the Union war effort in the West from Fort Henry to Shiloh, either need refurbishing or demand discarding." From the looks of it, Beemer believes that Wallace deserves more credit and recognition for his actions on the Union right at Donelson and will be mounting a vigorous defense of Wallace's Shiloh role (with the latter and the controversies and scapegoating surrounding it comprising the bulk of the study). For Spring 2016, University of Oklahoma Press is staying out west with The Civil War Years in Utah: The Kingdom of God and the Territory That Did Not Fight by John G. Maxwell and Jesus de al Teja's Lone Star Unionism, Dissent, and Resistance: Other Sides of Civil War Texas . Texas Unionism and the state's anti-Confederate resistance in its many forms have received a good deal of attention lately but the most recent treatment of 1861-65 Utah remains (I think) 1981's The Saints and Union: Utah Territory during the Civil War by E.B. Long. Also, the next Civil War related title from UOP's Campaigns and Commanders series will be Bruce Venter's Kill Jeff Davis: The Union Raid on Richmond, 1864 . I believe the subject (at least the Dahlgren part of it) was last explored in book format in Eric Wittenberg's Dahlgren bio Like a Meteor Blazing Brightly: The Short but Controversial Life of Colonel Ulric Dahlgren (2009) and before that Duane Schulz's The Dahlgren Affair: Terror and Conspiracy in the Civil War (1998). • A Want of Vigilance: The Bristoe Station Campaign, October 9-19, 1863 by Bill Backus and Robert Orrison (Savas Beatie, 2015). The latest entry from the Emerging Civil War series, A Want of Vigilance covers the indecisive fall 1863 Bristoe Campaign that was fought in central Virginia. Squeezed between Gettysburg and the Overland Campaign and lacking a massive capstone battle to go along with all the maneuvering, the operation hasn't received a great deal of attention until recently, with a nice atlas history and a very good campaign study to improve upon the older H.E. Howard series volume. A Want of Vigilance incorporates a nine stop driving tour into a narrative centered on the October 14 Bristoe Station battle, with additional chapter length coverage of the clashes at Auburn and Buckland Mills. In addition to the series typical maps and illustrations, the many appendices address a variety of topics, including expanded discussion of the famous Bristoe Station exchange between Lee and A.P. Hill, short looks at the Rappahannock Station, Kelly's Ford, and First Bristoe Station battles, a preservation timeline, orders of battle, and more. I always scan the Contributors section of essay compilations as they are frequently good sources for news about soon-to-be-finished projects from interesting Civil War scholars. In perusing the 'Look inside' materials available at the link to The Civil War and Reconstruction in Indian Territory , one notice that caught my eye was another mention of Richard McCaslin's A Distant Thunder: The Civil War in the Trans-Mississippi, which will be published at some future date by University of Nebraska Press. I first heard of this five years ago with the release of McCaslin's Rip Ford bio so hopefully the wait is nearly over by now. The current closest thing to a broad survey history of the Civil War west of the Mississippi is Alvin Josephy's The Civil War in the American West (1991) but that one left plenty of room for improvement and I would welcome a new synthesis of the current state of the T-M literature. Gallagher & Janney, eds. 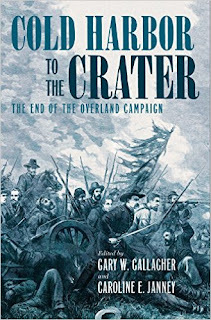 : "COLD HARBOR TO THE CRATER: The End of the Overland Campaign"
Cold Harbor to the Crater: The End of the Overland Campaign marks the welcome return of the Military Campaigns of the Civil War series from UNC Press after a nearly ten-year absence. With plans to pick up where this volume ends and continue on through the Appomattox Campaign before backtracking to address previously passed over First and Second Bull Run, co-editors Gary Gallagher and Caroline Janney maintain the series focus on the eastern theater. In addition to Gallagher and Janney, eight other scholars were invited to contribute to this volume: Keith Bohannon, Stephen Cushman, Keith Harris, Robert E.L. Krick, Kevin Levin, Kathryn Shively Meier, Gordon Rhea, and Joan Waugh. In the first chapter, Gallagher uses evidence from both private correspondence and public debates to contrast the popular standing of Lee and Grant during the period covered in the book. Much of the focus is on the domestic and foreign presses, which generally offered a favorable view of Lee but differed sharply over Grant's conduct of the Overland Campaign. The northern press were grudgingly respectful of Lee's ability, a practice that was not reciprocated by southern newspapers. Gallagher makes a solid point that the North's established two-party system meant that Grant would suffer far more than Lee from barbs hurled by a vigorously partisan adversarial political machine and press. Jefferson Davis certainly had his critics among newspaper editors but the lack of formal opposition meant that Lee would not be targeted in the same politically motivated manner that Grant was forced to endure. The next chapter by eminent Army of Northern Virginia historian Robert E.L. Krick examines the heavy reinforcements Lee's army received during a brief calm spell prior to the Cold Harbor battle and assesses their performance. Krick meticulously documents the divisions, brigades, regiments, and even companies that arrived on the Richmond front, along the way discovering units not listed in any previous ANV order of battle. Krick offers many examples of these units's introduction to the fighting in Virginia, a brand of continuous and fierce combat that many had not experienced before. Taking into account the variances in leadership, equipment and training typical to any ad hoc arrangement of mass reinforcement, the author finds that the fighting qualities of most new units compared favorably with their veteran ANV comrades (though command inexperience often led to unnecessary casualties). Kathryn Shively Meier takes the concept of soldier "self-care" that she developed in her prior book about the war on the Virginia Peninsula and applies it to the Overland Campaign. The examples she cites, a range of physical, mental, behavioral and spiritual coping mechanisms, are similar to those raised earlier. Some small differences related to continuous trench warfare are noted but perhaps an even more interesting interpretive slant might have been to compare the evidence from 1862 and 1864 and evaluate what soldiers learned about self-care during the two years of intervening warfare. Keith Bohannon highlights Lee's search for an army chief engineer for the spring campaign (the competent Martin L. Smith got the job) and the formation of specialized engineer units, organizations previously blocked by the Army of Northern Virginia commander for fear it would take too many fighting men out the ranks. Bohannon uses Cold Harbor as a case study of the work of these engineers, who were effective where used yet too few in number to oversee the entire front. He also shows how the self-preserving tendency of the men to instantly entrench in place sometimes worked to their disadvantage, with works often hastily constructed along unfavorable lines of defense. Joan Waugh's biographical chapter charts the meteoric rise of Francis Channing Barlow from private to major general as well as the "boy general"'s precipitous fall from grace during the Overland and Petersburg Campaigns. Rather than argue that Barlow's capacity was overrated or he was promoted beyond his ability, Waugh instead blames two nasty wounds, combat stress, chronic illness and the death of his wife for the general's problematic late war performance. Undeveloped is the possibility that his eccentricities, physical brutality directed toward his men, and labile personality together masked a serious psychopathology but Barlow's apparently seamless reintegration into successful family and civilian public life would argue against that. The Army of the Potomac's tricky disengagement from the Cold Harbor battlefield and crossing of the James River, the famous "stolen march" on Lee, is recounted in detail by Gordon Rhea. While Rhea lauds the planning and execution of the march, he finds that the oft repeated notion that it was a flawless operation to be a significant exaggeration. A snafu at the crossing itself meant that the number of troops available for the initial assault on Petersburg would be limited, although the units that did participate should have been more than enough for the job. Rhea is also justifiably critical of Grant for remaining in the rear supervising the crossing rather than being at the head of the army making sure the initial assault would not suffer from command confusion of the type that actually occurred. Keith Harris's essay examines the mindset of the men in the ranks during the opening months of the Petersburg siege. Far from feeling depressed and defeated after being driven into the Richmond-Petersburg fortifications, most of the writers in his sample expressed continued confidence in eventual victory (with some dissenting views, of course). 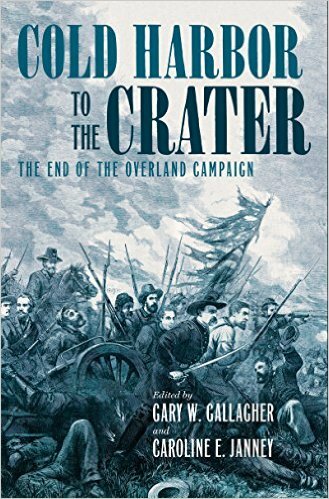 That most could remain so in the face of the crippling casualties suffered during the Overland Campaign is remarkable and hearkens back to Gallagher's opening essay that in part discussed expectations of high losses and the degree to which Lee embodied hope for the future. Confederate optimism peaked after the victory at the Crater but it would take many more months before any kind of general hopelessness set in. The civilian experience of the early months of the Petersburg siege is the subject of Caroline Janney's excellent overview essay. She documents the general bombardment of the town (an action supported by Union participants at the time but one they sought to distance themselves from in the post-war period) and how it affected the townspeople. Citizen militia participated in some of the early fighting but the war coming to Petersburg had dire consequences from the beginning. There were immediate food shortages, mass evacuations, and commerce outside select war industries and food distribution largely ceased. Overall, Janney finds that Petersburg's civilians, much like Harris's soldiers mentioned above, remained defiant and confident in eventual Confederate victory during summer 1864. The Crater battle is the focus of the final pair of essays, by Kevin Levin and Stephen Cushman. Levin offers a brief summary of the role of black troops in the summer 1864 fighting in Virginia, noting that while there were some noteworthy achievements with the Army of the James in June the July 30 Crater battle would be their first big test with the Army of the Potomac. Much of the chapter's focus lies in its thoughtful evaluation of the attitudes of white soldiers toward their black comrades, which were largely negative in the immediate aftermath of the defeat (and undoubtedly influenced by rumor reinforcing prejudice). That said, Levin determines the blame placed on the black troops for the disaster to be a temporary phenomenon, with veteran opinions softening over time to those more appreciative of their bravery and fighting qualities. Cushman adopts a different angle from which to view the Crater battle, that of fictionalized history in movies and books (specifically Anthony Minghella's Cold Mountain movie adaptation of the Charles Frazier novel and two novels, Richard Slotkin's The Crater and Glory Enough for All by Duane Schultz). Cushman explores a number of compelling art vs. history themes including selectivity of coverage, the decision whether or not to center narrative on a single heroic protagonist, the balance between history and artistic license, and the process of creating fictional speech from historical documents. Echoing trends in Civil War scholarship that have developed over the decades following the inception of the series, the essays in the tenth volume reach beyond the battlefield to a degree greater than that found in any of the previous nine. That Cold Harbor to the Crater manages to do this while also maintaining a reasonably coherent overview of a critical period in the war reflects credit on the work of general editors Gallagher and Janney. Reinvigorated, and with an expanded variety of themes and sub-topics, the Military Campaigns of the Civil War series appears to have a bright future again. "After many pages, I had to ask myself…what about the War? It is a topic almost completely missing from the pages of his book. Was he trying to obscure the fact that he did not serve when so many other young men were in the military? Was the War really such a minor topic to those in the Far West?" It's not terribly surprising that Twain doesn't address the war in the book. The motivations of writers in ignoring or pushing far into the background the great events and cataclysms of contemporaneous history have often been questioned. Jane Austen has been frequently criticized for depicting a middle class life in the country that hints little at the momentous political and social upheaval going on just across the Channel in Revolutionary and Napoleonic France and Europe. Our Jane's question of how interested in the Civil War (after all, thousands fled West to escape its horrors) the people of Far West were is a good one and it's a subject that's being explored in increasing depth. Though still only scratching the surface, a number of recent books and articles have examined how residents of the Pacific Northwest, Montana, and California reacted to the secession and war years. Most recently, I read a fascinating article edited by Cary C. Collins and published in the Summer 2015 (Volume 29, Number 2) issue of Columbia: The Magazine of Northwest History (the quarterly journal of the Washington State Historical Society) titled "A Most Uncivil Civil War – Registering Walla Walla for the Draft in 1864." Drawing heavily from Eells's own accounts, the article vividly describes the often harrowing experiences of Edwin Eells as a conscription officer in Washington Territory. It provides abundant evidence of just how much the war, national politics, and the draft occupied the minds and actions of those Americans living in places far removed from the actual fighting. I would highly recommend the article to anyone interested in the subject of the war in Far West. A recent book The Civil War and the West: The Frontier Transformed also offers a lengthy and helpful bibliographical essay, pieces of which one can view at the link provided. Tales from the Haunted South: Dark Tourism and Memories of Slavery from the Civil War Era by Tiya Miles (UNC Press, 2015). From the publisher: "In this book Tiya Miles explores the popular yet troubling phenomenon of "ghost tours," frequently promoted and experienced at plantations, urban manor homes, and cemeteries throughout the South. As a staple of the tours, guides entertain paying customers by routinely relying on stories of enslaved black specters. But who are these ghosts? Examining popular sites and stories from these tours, Miles shows that haunted tales routinely appropriate and skew African American history to produce representations of slavery for commercial gain." After brief detour with Crook in Montana the magazine is getting back to the Civil War, to the North Anna Campaign to be precise. 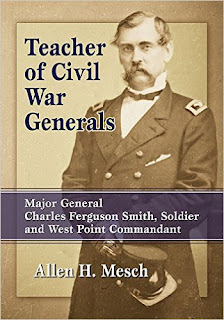 Mesch: "TEACHER OF CIVIL WAR GENERALS: Major General Charles Ferguson Smith, Soldier and West Point Commandant"
Though a widely recognized figure to serious students of the Civil War, Charles F. Smith was one of those unfortunate generals of high rank, ability and reputation who died too early in the conflict to make an indelible mark in the popular imagination. Though his Civil War service was one of unrealized potential, Smith's antebellum army career was a long, eventful and important one worthy of close examination. 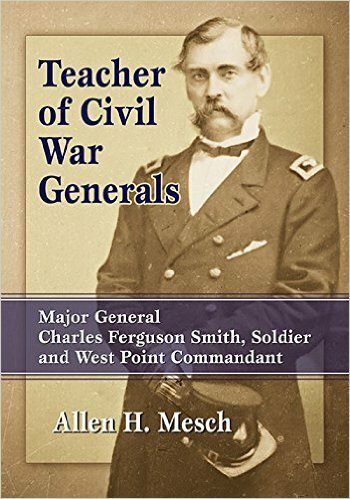 Allen Mesch's Teacher of Civil War Generals: Major General Charles Ferguson Smith, Soldier and West Point Commandant certainly does that and is the first full length military biography to appear in the literature. Mesch's discussion of Smith's early life is even briefer than that typically found in books of this type, dispensing with Smith's upbringing in mere paragraphs before launching into future general's appointment to West Point at the age of 13 (his family lied about his age). Born in Philadelphia in 1807, Smith was the son of an army assistant surgeon who eagerly pressed his eldest son's case for a West Point education. Not a brilliant student, Smith was forced to repeat his first year but steadily improved his standing, graduating in 1825 ranked 18th in his class and earning a 2nd lieutenancy in the 2nd Artillery. After four years of garrison and arsenal duties, he returned to West Point as a tactics instructor and became so highly regarded there that he was elevated to the coveted post of Commandant of Cadets in 1838. A strict but fair disciplinarian in his four years as Commandant of Cadets, Smith earned the respect of students and colleagues alike although he would run into occasional problems when attempting to punish some of the more politically connected cadets. Mesch credits Smith with sharpening and regularizing the initiatives pioneered by Sylvanus Thayer that were designed to improve all areas of soldierly conduct and discipline. As instructor of tactics at the academy, Smith would also positively influence many future Civil War generals (the list is a lengthy one). More than one of these men would describe him as the "ideal soldier." At the outbreak of war between the United States and Mexico Smith was a captain leading Company K of the 2nd US Artillery regiment. Earning several brevets, he distinguished himself both with Taylor's army in northern Mexico and with the army of Winfield Scott operating from Vera Cruz into the Mexican interior. In the battles fought around Mexico City Smith would capably lead a light infantry battalion. After returning home, Smith continued to suffer from the chronic bowel maladies not uncommon to Mexican War veterans but he steadily climbed in rank and in between extended sick leaves was able to contribute to a new artillery manual. In 1855, he was appointed Lieutenant Colonel of the newly formed 10th Infantry Regiment and the following year led a military expedition up the Red River in Minnesota, his dual mission to warn off the large number of British subjects hunting and trapping illegally in the U.S. and to establish a new military post in the area. After that, Smith served as one of the highest ranking officers on the Utah Expedition. He was on leave from his duties there when war broke out with the Confederacy. The book offers detailed accounts of all of the above mentioned events from Smith's distinguished antebellum military career. In 1861, while en route to his new post as commandant of New York's Fort Columbus, Smith was temporarily appointed to command the Department of Washington defenses. According to Mesch, Smith was given little credit for energetically organizing the capital defenses during the very brief time he was in charge there and left the city under some cloud of suspicion, which the author blames on unsubstantiated rumors floated by reporters dissatisfied with access to the commander. After almost despairing of gaining an active command, Smith got his wish in August with orders to go to the Department of the West, where he would be placed at the head of the District of Western Kentucky with headquarters at freshly seized Paducah. It would be at Paducah where Smith's tight adherence to regulations and his regular army ideas of discipline would endanger his career. His strict orders protecting private property and forbidding maltreatment of civilians of all political persuasions placed him at odds with chief subordinates Eleazer Paine and Lew Wallace, who conspired against him. Smith, unlike many of the more politically astute high ranking Union officers, also failed to cultivate any support among the newspaper reporters hanging around the district, earning their ire by actively blocking access. Mesch carefully documents how accusations and rumors regarding Smith's loyalty (none of which had any foundation in truth) nearly cost him his promotion to brigadier general. All armies are rife with command jealousies but the Civil War armies offer legions of examples whereby professional army officers of long service and proven ability were leapfrogged in rank within the new volunteer forces by both political appointees and fellow officers of far inferior antebellum grade. The highly esteemed Smith's apparently cheerful subordination to the then lowly Grant is one of the great exceptions. Though one might reasonably wonder whether the traditional story holds up to scrutiny, Mesch apparently didn't discover any evidence casting doubt on the oft repeated analysis of the cordial Grant-Smith relationship. The only negative words about Grant from Smith's pen were those (expressed in a private letter to his wife) that were critical of Grant's Belmont operation. Throughout the book, Mesch makes good use of Smith's papers and the insights they offer into the general's private thoughts at various up and down points in the war and his relationship with his family. The book presents a thorough treatment of Smith's role in the campaign that seized forts Henry and Donelson. At Donelson, Smith's division would be placed on the far left of Grant's investing army. While this would be the least likely battlefield sector to see action if the Confederate garrison tried to escape (which it did, of course), it was the position directly astride the Union line of communications and thus a place to be held by a trusted subordinate. When the Confederate breakout stalled, Smith's division attacked the weakly held enemy right and captured the outer defense line in its front. Though eventually contained, Smith's advance went some way toward convincing the Confederates that their overall position was untenable. After Donelson, Halleck, who trusted Smith as much as he distrusted Grant, placed Smith is charge of operations to further penetrate the river line into Tennessee. On March 12, after a meeting with Wallace, Smith badly scraped his shin (apparently down to the bone) on a seat edge. Only able to perform light duties from his office he was promoted to major general on March 21. While it pained Smith to miss leading his men at Shiloh, it pleased him to learn that his men fought gallantly. Sadly, Smith's infected wound only worsened and he died six weeks later on April 25. It's impossible to predict how much impact Smith might have had in the war had he lived, and Mesch does not delve into alternative history, but there's little doubt that as a Grant and Halleck favorite he would have risen far in the Union high command. Many biographers overstate the historical impact of their subjects but Mesch's study powerfully argues that Smith's lengthy military career has been underappreciated. Decades of exemplary service in the field combined with a key role in the development of the officer corps of the United States during the antebellum period comprise a significant legacy, one documented in fine form in Teacher of Civil War Generals. 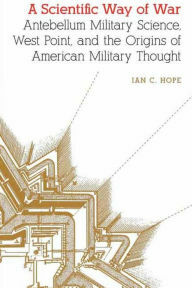 Hope: "A SCIENTIFIC WAY OF WAR: Antebellum Military Science, West Point, and the Origins of American Military Thought"
When it came to its military establishment, the fledgling American republic naturally leaned heavily on continental (especially French) philosophies, practices, and education. However, this devotion would not be slavish but rather adaptive to a force very different from the large European standing armies. In his book A Scientific Way of War: Antebellum Military Science, West Point, and the Origins of American Military Thought, Canadian military officer and history professor Ian Clarence Hope argues powerfully that students should be less concerned with the long standing debate over how "Jominian" the nineteenth century U.S. military was and more cognizant of how an emphasis on mathematics and science uniquely informed the training of professional American officers and by extension the way American wars would be fought. Hope begins in the colonial and early republic years, when military engineering was placed in the hands of European experts at both state and federal levels. When West Point was founded in 1802 some of these men were hired on as faculty. In the wake of the poor performance of the state militias during the War of 1812, the Third System of national defense was established and would be in place for half a century. It would be an integrated continental system, with massive masonry forts located near the entrances to key ports and waterways connected by road (and later railroads) to arsenals, depots, and magazines safely placed inland. The regular army would man these forts and stall enemy invaders long enough for the militia to mobilize or perhaps repel them altogether. Military manuals developed by the federal government would be available to the public in peacetime with the hope that regular army and militia might possess at least a modicum of shared doctrine when the time came for them to fight together. Militarily, it was a flawed system, but it was politically palatable. The book details the curriculum requirements of each of the four West Point years and shows how the single-minded emphasis on military science, math, and artillery were directly wedded to the requirements of the Third System and the concept of the expansible army. Critics past and present have condemned the antebellum curriculum as being too focused on engineering (and indeed a fifth year with added classes on strategy and history was briefly implemented) but Hope sees this as a fundamental misreading of the constraints American politics and society placed on its military. With national aversion to a large standing army, the U.S. military establishment had to be lean and its officers flexible generalists, with the capability of coordinating rapid expansion in times of dire emergency. The USMA was entirely unique among the world's preeminent national military schools in that it educated all of its officers in the fundamentals of every branch — the infantry, cavalry, artillery, and engineers. With large numbers of graduates cycling through the staff bureaus, assuming key engineer, quartermaster, ordnance, and paymaster duties at various posts and also gaining vital experience siting, organizing, managing, and constructing complex fortifications and other military installations, conscientious West Pointers had the background to competently handle every task asked of them and would be well placed to handle the challenges of the "expansible army." A prevailing thought was that science would win wars by common process, mitigating the need for military genius (a rare, elusive and unpredictable quality) in gaining victory. Internal improvements were also a vital element of the Third System and Hope also demonstrates the indispensability of West Point trained engineers in designing and managing these huge public works projects that would link installations and regions. Predictably, questions would arise concerning specific projects and whether they advanced purely commercial interests over true military necessity, but the advantages of using army engineers and the lack of suitable alternatives would trump allegations of shady practices. Given the fact that many West Point graduates would find most of their combat experience comprised of Indian fighting on the frontier, another criticism of the West Point curriculum involved the absence of any discussion and instruction over le petit guerre. A kind of 'class in the field' program designed to address this deficiency was proposed but it never went anywhere. Objections over the doctrinal negligence of the frontier in favor of the Atlantic focus of the Third System seem justified but Hope persuasively contends that the possibility of successful invasion by a seafaring European power like Great Britain and the dire consequences that would follow outweighed military considerations attached to the numerous yet strategically insignificant encounters with American Indians. New additions to the West Point curriculum would mean that something else would have to go. Though Hope finds that the degree of anti-professionalism ascribed to the Jacksonian Period has been exaggerated, he does go into some of the political challenges to West Point, most of which were resolved by the excellent performance of academy graduates in the war with Mexico. The engineers especially shined in their applications of military science to reconnaissance, siege operations, logistics, and artillery. The chapter covering the Civil War years might disappoint some readers in its brevity [using examples, it focuses mainly on the establishment and use of bases and lines of operation directed toward the capture of strategic points], but it does effectively stress the span as one of continuity with the military science and professionalism of the antebellum period. A Scientific Way of War is a well researched and keenly argued defense of the nineteenth century U.S. army officer corps against historical charges of narrowly limited education and military dilettantism. Instead, the picture author Ian Hope paints of West Pointers is one of broadly knowledgeable and highly professional officers well adapted to the traditional social and political boundaries uniquely applied to America's budding military power. It also inspires an even greater appreciation of West Point graduate, theorist and instructor Dennis Hart Mahan, who left an indelible stamp on military science and the academy. This study is highly recommended to any reader interested in the early development of the U.S. army. The Bulloch Belles: Three First Ladies, a Spy, a President's Mother and Other Women of a 19th Century Georgia Family by Walter E. Wilson (McFarland, 2015). From the publisher: "The Bulloch women of Roswell, Georgia, were not typical antebellum Southern belles. Most were well educated world travelers skilled at navigating social circles far outside the insular aristocracy of the rural South. Their lives were filled with intrigue, espionage, scandal, adversity and perseverance. During the Civil War they eluded Union spies on land and blockaders at sea and afterwards they influenced the national debate on equal rights for women. The impact of their Southern ideals increased exponentially when they integrated into the Roosevelt family of New York. Drawing on primary sources, this book provides new insight into the private lives of the women closely linked with the Bulloch family." 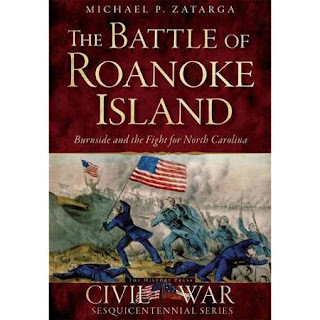 Zatarga: "THE BATTLE OF ROANOKE ISLAND: Burnside and the Fight for North Carolina"
The Union army and navy's campaign to seize and occupy resource-rich and strategically important eastern North Carolina unfolded in two stages, the first in 1861 resulted in the seizure of key inlets along the Outer Banks the gains of which set up the following year's advance into the region's rivers and sounds. The success of the 1862 Burnside Expedition was a model of interservice cooperation that clearly demonstrated the potential of amphibious operations to have a real impact on the outcome of the war. Both the 1861 and 1862 operations have had the benefit of detailed coverage in the literature and publisher The History Press has been a significant contributor, especially for the former. Absent from body of work this has been a reasonably full treatment of the February 8, 1862 Battle of Roanoke Island, one of those small Civil War engagements with large consequences. In this case, the Union victory and Confederate surrender on the island opened the entire breadth of the Pamlico and Albemarle sounds to invasion. Michael Zatarga's The Battle of Roanoke Island: Burnside and the Fight for North Carolina marks the first telling of the battle's history in book length format. Zatarga does a nice job of presenting the many challenges involved in setting up the Union expedition, from recruiting soldiers to obtaining the necessary ships and supplies. All readers are familiar with Burnside's checkered Civil War career but the overall leadership quality of the Coast Division was exceptionally solid from the brigade leaders to the regimental commanders (many of whom would lead brigades and divisions of their own later in the war). Even so, with no specialized training and little in the way of institutional combined operations expertise, it's remarkable the landings went as well as they did. However, the problems Union leaders faced paled in comparison to those of the Confederate defenders. Torn between the needs of Virginia and North Carolina, the island defenses were generally neglected by the high command. Progress in fort construction was fitful and requests for modern heavy cannon of the type necessary to ward off federal gunboats were repeatedly denied. The placement of political general Henry Wise in command of the island also did not bode well. Roanoke Island was one of many prime examples of Confederate mismanagement of the defense of fixed points located on or near waterways. Not enough equipment, men, and resources were allocated to successfully defend the island but enough were present to make their total loss materially damaging to the Confederate war effort. The bibliography doesn't list much in the way of manuscript resources but the large body of published primary source materials and newspapers, along with a good selection of secondary sources, were leveraged well in creating a commendable narrative history of the operation, equally strong in its naval and army components. The six chapters recounting the amphibious landings on the island and the four-hour infantry battle fought on the following day together comprise the best available account of the Battle of Roanoke Island. The battlefield itself (a large expanse of open swampland bounded on all sides by dense thickets and dominated by Confederate trenches flanking a small battery topping a slight rise in the middle) and how its terrain features impacted the course and conduct of the battle are well described in the text. With odds eventually reaching 8 to 1, the Union attackers gradually infiltrated the woods on each flank and were able to overpower the Confederate defenders. The ensuing rout led to a complete, and probably unnecessarily hasty, Confederate unconditional surrender of the entire island, an act which placed in federal hands over 2,000 prisoners and dozens of heavy guns. Zatarga also briefly recounts the island's role as a magnet and safe haven for escaped slaves, who were valuable sources of local knowledge and also became a welcome labor force for the Union army. The book does have some notable flaws. Factual errors in the background material and typos crop up with some frequency. Strangely enough, while the battle maps provide a more than adequate representation of terrain and troop movements, a map of Roanoke Island itself is absent. In order to really understand the flawed Confederate plan of defense and the naval phase of the battle, readers will want to print one out from another source for handy reference. 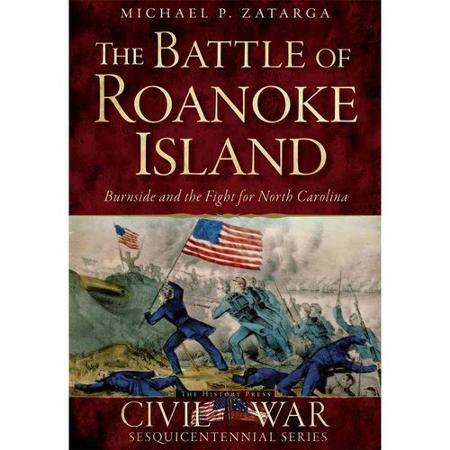 That said, primarily on the strength of the author's account of the previously underexplored events of February 7-8, Michael Zatarga's The Battle of Roanoke Island is a useful addition to the literature of the 1862 Burnside Expedition.